A recent survey of Americans shows that while 46.8 percent of people believe you should eat the whole piece of candy corn at once, a nearly equal amount (42.7 percent) believe in starting with the narrow, white end. 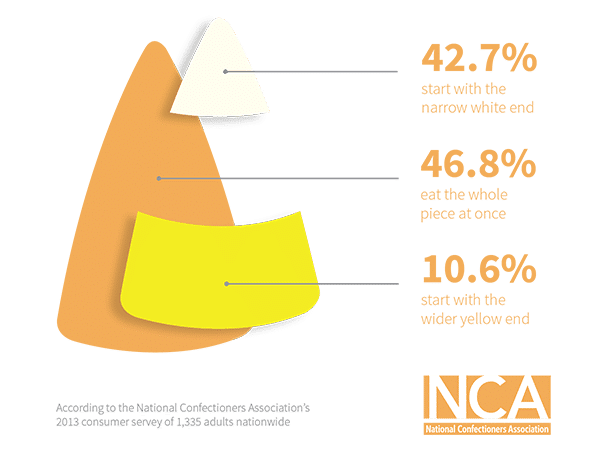 Only 10.6 percent of respondents start with the wider yellow end when enjoying a piece candy corn. Candy corn has existed for more than 100 years. According to oral history, George Renninger, an employee of the Wunderlee Candy Company, invented the popular confection in the 1880s and Wunderlee became the first to produce the candy. The Goelitz Candy Company (now Jelly Belly Candy Company) started producing the confection around the turn of the century and still produces the popular Halloween candy today. Candy corn first appeared when America was largely an agrarian society. The tri-color design was considered revolutionary and the public loved it. Lack of machinery meant that candy corn was only made seasonally, probably gearing up in late August and continuing through the fall. It has remained unchanged for more than 100 years and is a favorite at Halloween. How is candy corn made? In 1900, it was the job of many men to produce candy corn several months of the year. Sugar, corn syrup and other ingredients were cooked into a slurry in large kettles. Fondant and marshmallow were added to give a smooth texture and bite. The 45 pounds of warm candy was poured into buckets called runners. Men called “stringers” walked backwards, pouring the candy into cornstarch trays imprinted with the kernel shape. It took three passes to make the white, yellow and orange colors. Originally, it was delivered by wagon in wooden boxes, tubs and cartons. The process of making candy corn is very similar today, but now machines do much of the work. Manufacturers use a method called the corn starch molding process. Kernel-shaped depressions are made in a tray of corn starch. Candy corn is made from tip to tip in three-color passes. First, the depression is filled with partially set white candy, known as mellowcreme. Next, the orange mellowcreme is added. The mold is then finished by adding the yellow mellowcreme and is cooled. After is it has finished cooling, the trays are emptied and a confectioners glaze is added to make the kernels a little shiny. At last, the little candy corns are ready to be eaten. October 30 is National Candy Corn Day. Candy corn is not just for Halloween anymore. Candy makers have made Christmas, Valentine’s Day and Easter themed candy corn in recent years. They’ve also introduced several additional flavors of candy corn – from peppermint to pumpkin spice.